Last week I heard my dad tell me that my Grandpa (his father) had passed away. I'd never heard words like that before so the feelings were all brand new. I've been blessed to have both sets of grandparents alive and relatively healthy for my entire life. This past September we all gathered together to celebrate my Grandpa's 90th birthday, not knowing it would be our last time all together. 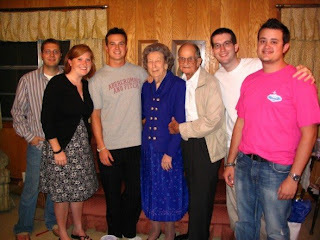 My Grandpa was a great man who loved the Lord very much. He had a love for helping people that was humbling to those who crossed his path. He never met a stranger and welcomed everyone with a hug. He loved to fish, send letters, and mow yards. He ended every conversation with, "We love you too...and that's the truth." He'd normally say it before the other person had a chance to say, "I love you." I always thought it was funny...looking back I appreciate it. He knew I loved him...but it was more important to him that I knew he loved me. For as long as I can remember my grandpa made a hobby of sorts of going to funerals and weddings. He would average about 3 a week...and that's on the low end as he got older. He knew it was important to be there for his friends, co-workers, church members, distant relatives, etc. He would find the announcement or obituary in the paper, cut it out, and paste it to one side of the paper while typing a message to the family on the other. Someone told my aunt this past weekend that he probably spent our inheritance on stamps. He was a good man and genuinely cared for other people without needing any sort of attention. That's the kicker to me. He never needed attention. He was happy to just give. When he saw you...wherever it was - the grocery store, the church parking lot, or even just entering from one room in the house to the next he would say, "where you at there pardner?" It was his own version of "what's up?!" He was a great cook, a dedicated husband, and a strong provider for his family. He scuffed his feet when he walked and his hands were rough. His heart was big and his love for others overflowed to all. I'm kind of jealous he is in Heaven but I'm excited to see him when I get there and hear him say, "Where you at there, Emily? Gosh dog it's good to see you." Once upon a time I watched a lot of MTV...and by a lot, I kind of mean every night, I was there watching the 10 spot. I have the first season of Laguna Beach on DVD to prove it. However...it's been a good 3 years since I've watched anything on MTV for longer than 10 minutes. I heard people talking abou the Hills finale and just for the sake of keeping up with the recent news, when I flipped by it yesterday, I stopped to watch. I saw that Lauren and Lo got a dog...it looked a bit familiar...I did some research this morning and low and behold...A PUGGLE!!! Chloe and Bauer would totally be friends...I'm sure! Ok, so you know that feeling of complete joy when somehow and in someway the world finds a way to combine two things you love??? 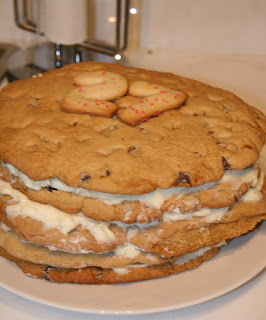 You know like chocolate chip cookie dough ice cream...or strawberry cheesecake, or Reese's peanut butter cups...pineapple salsa, most any casserole...or even things like amusement parks: you get roller coasters, funnel cakes, and the best people watching, or movies where your favorite actors come together...you get what I'm saying, right??? So yesterday, I heard my mom tell me about a new candy she saw at Walgreen's. 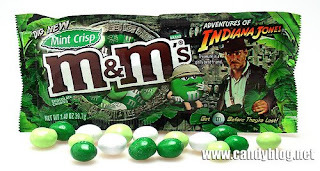 MnM (or the Mars candy company) has come out with limited edition Indiana Jones Mint Crisp MnMs!!!! They taste just like the Girl Scout Thin Mint cookies!!!! I love MnMs (who doesn't? I'm pretty sure they are the all American candy), I LOVE most anything Mint, and the crispy MnM's they had a few years ago - shout out to Rachel - have always been my favorite. PLUS Indiana Jones...HELLO! This is a no brainer people, please go out to the store and buy them! Joey Tribbiani: I know, and only one layer of jam? What is up with that? Joey Tribbiani: Well, I like it. Joey Tribbiani: I mean, what's not to like? 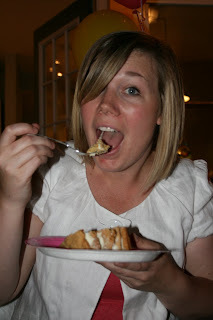 Custard, good. Jam, good. Meat, good! This weekend was a beautiful one for those of you here in Nashville. Despite some showers Friday night and early Saturday AM it cleared out for two BEAUTIFUL days that only increased the wonderfulness of my weekend. Did anyone see the clouds on Saturday afternoon? There were low ones and high ones...it looked really cool. Sad I don't have a picture. Friday night - Darren's Dance Grooves ... need I say more? Who needs Ty-BO when you can learn to groove along with groove-a-loos...seriously people?! Saturday - Saturday was fabulous. My most favorite day at my church has been the 3on3 basketball tournament probably since before I went to the church. I LOVE IT! It represents what The Church is all about to me. I love the fact that it takes the entire church body to pull it off. I love the fact that no matter what you do that day and how you choose to participate you WILL meet new people and be able to be Christ to people who may not have had that opportunity before. No other day do we reach out to our community more than on the 3on3...this is church...meeting the community where they are and cool springs is definitely all about some sports, free stuff, and inflatables!!! Saturday night I heard wonderful music from the Nashville Symphony in the new Schermerhorn. It was beautiful...as was the music! Before hand, to be honest, I was more excited about just going inside the building then actually hearing the music, I couldn't have been more excited to go. It turns that the music is just as great as the architecture (minus some coffee beans). I LOVED IT!...all of it, the whole night was great! We actually sat behind the orchestra so we were able to watch the Mistro's face (which might have been my favorite part of the night!). The symphony was doing a tribute to Louis Armstrong and they did a great job!!! They brought in a guest trumpet player who was really good, and funny...most of the time. 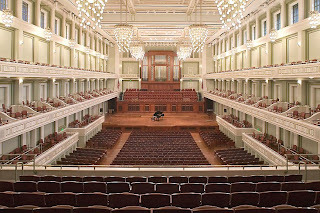 If you haven't been to the Schermerhorn I would strongly suggest going! Sunday was sooo pretty, and soooo nice to be outside for parts of the afternoon. It was also Lele's birthday! And it case you didn't know, this is going to be the best year of her life!